Purchased as Lot 292 at the Magic Millions 2017 Perth Yearling Sale. ORATORIO (AUS) (Bay 2001-Stud 2005). 4 wins-3 at 2, MVRC CS Hayes S., Gr.3. Sire of 396 rnrs, 235 wnrs, 15 SW, inc. Lucky Street (WATC Karrakatta P., Gr.2), Motion Pictures, Clueless Angel, Gold Rocks, Waratah's Secret, Private Dancer, Gold Busker, Rafaello, Cadenza, Mr Motown, Palace Intruder, Belora, Like an Eagle, Latoria, Trustee Brown, SP Dancing Express, Outlaw Pete, Moet Me, Shades of Rio, Passion Cantata, Colourful Charade, Indigo Ora, etc. SALADE (c. by Snitzel). Winner at 2, A$173,200, ATC Pago Pago S., Gr.2, 2d Illawarra TC AJ Lillye Memorial H. Sire. Janeiro (g. by Oratorio). Placed at 3 in Aust. Two Lipsticks (f. by Charge Forward). Placed at 3 in Aust. PRIZED ICON (More Than Ready). 3 wins-2 at 2-at 1600m, 2500m, A$2,031,450, to 2016-17, VRC Victoria Derby, Gr.1, ATC Champagne S., Gr.1, Fernhill H., L, 2d VRC Australian Guineas, Gr.1, ATC Chipping Norton S., Gr.1, Tulloch S., Gr.2, Schweppervescence H., Gr.3, Scone RC Inglis 3YO Guineas, RL, ATC Carrington S., L, Lonhro P., L, 3d ATC Ranvet S., Gr.1, Spring Champion S., Gr.1, Gloaming S., Gr.3, Canberra RC Black Opal S., Gr.3, ATC Breeders' P., L, TAB More Than Winning 2YO P., Spring Preview H., 4th ATC Apollo S., Gr.2, Up & Coming S., Gr.3. WHISPERED SECRET (High Chaparral). 2 wins at 2, A$192,700, in 2016-17, ATC Fernhill H., L, 3d ATC Champagne S., Gr.1, Tab.com.au 2YO P.
Best of the Rest (Northern Meteor). 5 wins from 1100m to 2200m, A$239,430, BRC XXXX Gold H., Racing Retro H., 2d BRC PFD Foods H., ATC Canterbury League Club H., Jamberoo Action Park H., Ranvet H., 3d BRC Tails S., L, Mount Alvernia College H., Qld Tatt's RC Sapphire Recruitment H., ATC McGrath Estate Agents Principals H., Australian Turf Club 2YO H., 4th Qld Tatt's RC Recognition S., L.
ROMANTIC MOON (More Than Ready). 3 wins-2 at 2-at 1200m, 1500m, A$223,130, ATC Sweet Embrace S., Gr.3, Sydney Spring Carnival on Sale H., John Cootes Furniture 2YO P., 2d ATC Winter S., L, 3d ATC Hyland Race Colours H., Sydney Markets Foundation H.
Modoc (Haradasun). 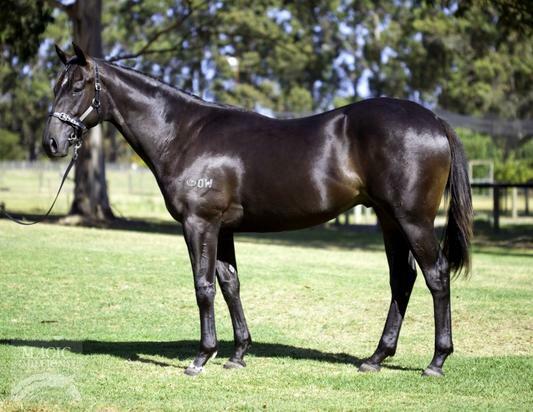 2 wins at 2, A$169,050, 2d MRC (Mornington) Inglis 2YO Premier, RL, 3d ATC Skyline S., Gr.2, 4th ATC Pago Pago S., Gr.2. KABAYAN (Haradasun). 4 wins-1 at 2-from 1000m to 1600m, A$331,150, HK$6,064,750, ATC Stan Fox S., Gr.2, HKJC Kwangtung Cup, Fairy King Prawn H., 2d BRC TJ Smith S., Gr.1, MRC HDF McNeil S., Gr.3, ATC Power Access 2YO P., HKJC Wyndham H., Ho Sheung Heung H., Good Ba Ba H., 3d HKJC January Cup, L, Sa Sa Ladies' Purse, L, Kwangtung Cup, Hau Wong H., Audemars Piguet Jules Audemars H., Jinbao Street H., Cafeteria H., 4th HKJC Sa Sa Ladies' Purse, L.
Tobacco. 7 wins to 1400m, A$77,800, 102,650Rgt. in Aust. and Malaysia, Perak TC Class 1 H., QTC Divide & Rule H., BTC Ansett Australia H., Courier-Mail's New Life H., 2d Selangor TC Class 1 H., 3d Penang TC Pesta Pulau Pinang Cup, Qld Tatt's RC Express Post H., VATC Galleon H.
Race Record: 4 Starts 0-0-0 A$2,230.